Who makes the Bite's best ABL line-up? With the eighth edition of the modern day Australian Baseball League now behind us, the team at theabl.com.au has accepted the unenviable task of selecting an all-time best team for all six franchises. With a plethora of talent - both locals and imports - taking centre stage over the league's eight-year history it is far from an easy task. But we have narrowed the talent pool down, completing a line-up card with nine hitters and starting, relief and closing pitcher for each of the six teams. McOwen is probably remembered by Adelaide fans for his deflection to Perth ahead of season two, rather than what he achieved in the city of churches. But if they think beyond the pain of losing him, they will remember McOwen as they very first Helms Award winner in the relaunched ABL. The centrefielder hit .340 with 11 homers and 30 RBIs. His 51 hits ranked second in the league. Cowan spent two seasons at Adelaide, hitting 291 across 64 ABL games. After injury cut short his 2015/2016 campaign, the Seattle prospect returned a season later and hit .291. He led the Bite with 13 doubles and finished equal second on the team with 43 hits. 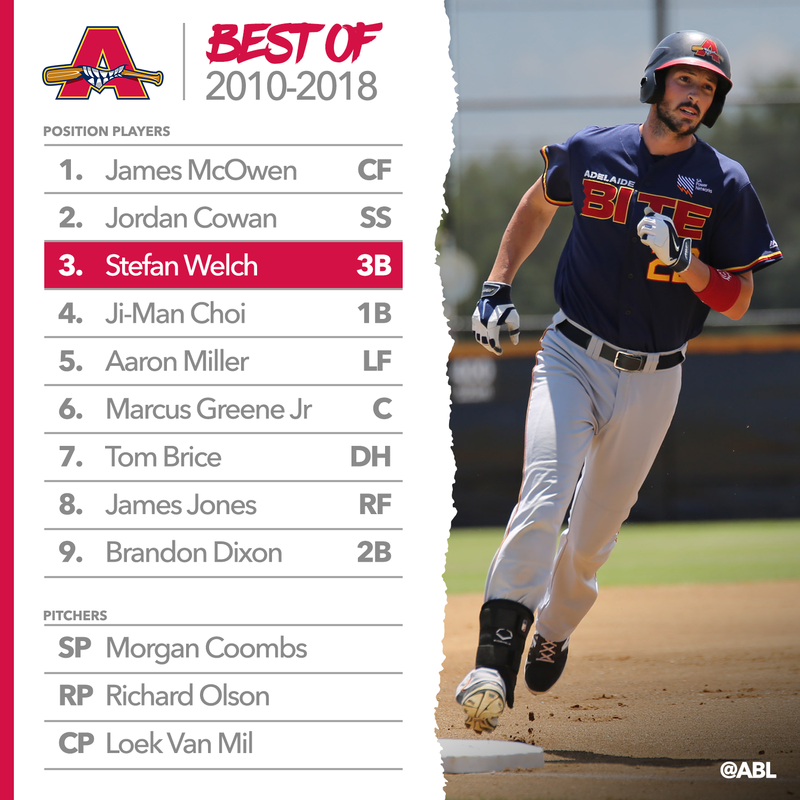 Welch held down third base and a was a key offensive post for Adelaide during the first seven seasons of the relaunched ABL. He is the all-time games played, hits, home run and runs batted in leader at the Bite. Welch tallied more than 15 RBIs in all seven of his seasons in the league and homered seven-plus times three times. He finished a career .257 hitter and also provided solid defence, mostly at third base. Now a big leaguer, Choi spent the 2012/2013 ABL season in Adelaide colours. In 40 games he hit .309 with eight homers and 31 runs batted in. Choi walked 26 times and struck out just 27, ending with the fourth best OBP (.419) in the ABL. 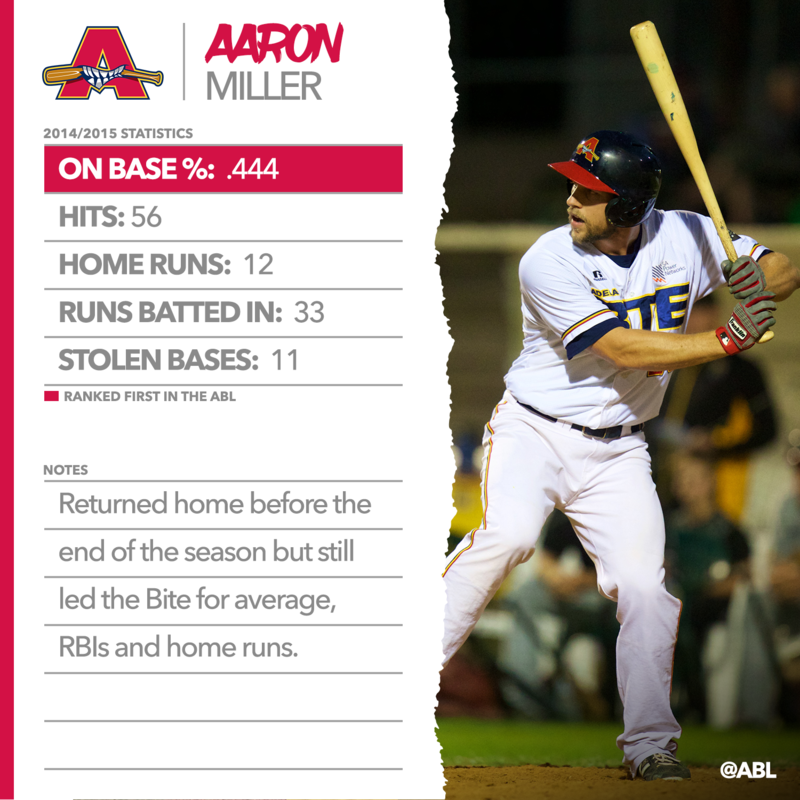 Miller is regarded as one of the best hitters the ABL has seen. In 36 games during the 2014/2015 season he batted a league-best .389 and finished with an on-base percentage of .444. Despite returning home before the end of the season, Miller's 56 hits ranked him third in the league. He finished with 12 home runs, 33 RBIs and 11 stolen bases on his way to claiming the Helms Award. Greene enjoyed a solid 2016/2017 season with Adelaide, hitting .307 with six homers and 26 RBIs. He was particularly dangerous at home, averaging .345 at Adelaide Shores. Defensively he was rock solid, ending 10 of 30 stolen base attempts. Brice played 158 games for the Bite across two stints, finishing a .294 lifetime hitter in the ABL. The inaugural season of the relaunched league was his best with the left-hander averaging .314 and blasting seven home runs to go with 26 RBIs. He returned to Adelaide in 2014/2015 and was a key figure in the Bite's ABLCS run. Brice averaged .300, finishing with an OBP of .403 and 18 runs batted in. Jones dazzled in Adelaide during the 2011/2012 season, leading the Bite with a .307 batting average. The right-fielder crushed eight home runs and drove in 25 runs. He also stole six bases and finished with an unblemished fielding record in the outfield. Dixon collected Bite MVP honours in his sole season in Adelaide. The LA Dodgers prospect shone at second base and in the Bite's formidable batting order. He hit .289, collecting 107 total bases in 47 games. Dixon drove in 30 runs, homered nine times and stole 21 bags on 23 attempts. 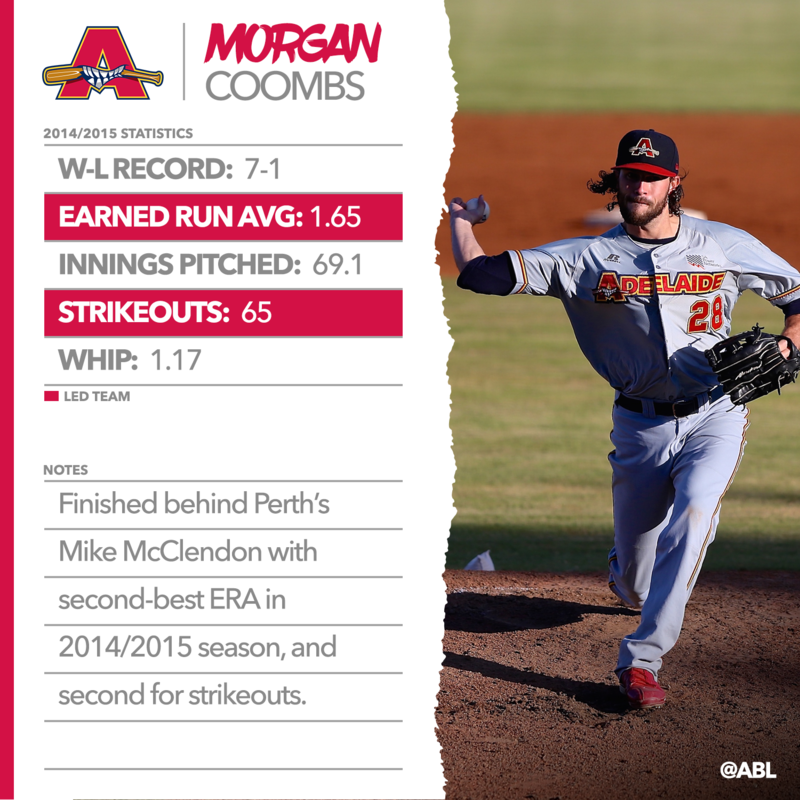 Coombs ranked second in the league for ERA (1.95) during the 2014/2015 season and tied with Scott Mitchinson for second most wins (seven). The right-hander went 6-1 with a 2.14 ERA in 11 starts, striking out 55 hitters. He was also effective when used out of the bullpen and excelled at Norwood Oval. He went 5-0 with a 1.17 ERA and picked up 40 of his 65 strikeouts at the Bite's home ballpark. Olson compiled a 1.56 ERA during two seasons in Adelaide after switching from Sydney. In his debut season for the Bite he was 5-2 with a 2.48 ERA. His 1.38 walks per nine innings was the best ratio in the ABL. Olson backed it up a season later, finishing 3-1 with a 0.74 ERA in 22 appearances. The right-hander gave up just one homer in 75 1/3 innings across his career. The 216cm Dutchman has spent the past three ABL seasons in Adelaide, recording a 2.25 ERA in 47 appearances out of the bullpen. His best campaign was in 2016/2017 as the Bite finished the regular season in second spot. Van Mil made 18 appearances, compiling an ERA of 0.40 and going 8-for-9 in save opportunities. He allowed just one earned run in 22 1/3 innings. Van Mil struck out 25 hitters and walked just seven. How did we go? Who would you have in your best Adelaide Bite team? Stay tuned for the Best of Brisbane Bandits on April 6.